Have Friends, Family looking for calling Pakistan? Try Pidipompi quality calling cards and phone cards which offer the low rates with best voice quality you need to save money on international call Pakistan. 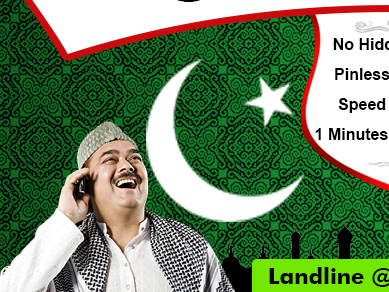 With our cheap calling cards to Pakistan enjoy clear calls at any time of the day. We provides cheap calling to Pakistan, call Pakistan from USA and Canada, Pakistan calling card, cheapest call rates and plan to Pakistan. 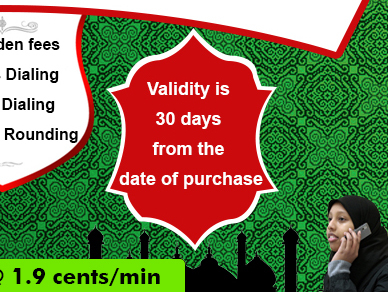 Validity is 30 days from the date of purchase. There will be $3.99 service fee for $10 product, $4.99 service fee for $20 & $30 product. You can purchase one of our monthly pack against which you will acquire a set of minutes which you can use for calling to anywhere in these countries under our most reasonable rates. The duration of the monthly pack is exactly one month, starting from the day you purchase the pack. The monthly pack renews automatically after the expiry of the one month period unless you cancel the monthly pack yourself. There are no contractual obligations attached to these monthly pack. For instance if you purchase our $30/month monthly pack for calling to Pakistan on 26th of March, then you can use 1055 mobile minutes from 26th March through 25th April. On 26th April your account will be renewed and you will be awarded a new set of 1055 minutes for next one month. Any unused minutes from the previous month will be lapsed. In case you exhaust all 1055 minutes before end of month, With our auto recharge facility you will never run out of minutes. We keep a check on your balance and as soon as your balance falls below $2, your pin gets recharged automatically with the initial purchase amount. This service is enabled by default when you purchase a new pin. Currently we are having a Thirty Day Money Back Guarantee Scheme, only for new customers who opt to purchase a Monthly Pack. Under this scheme, you are guaranteed to get your money back if you send a request to our Customer Care within 30 days and if you have not spent more than 25 minutes of your minutes. Pidipompi.com reserves the right to charge fees, surcharges and/or price at any time upon without prior written notice to you.